Sam Gribben was frustrated that he wasn’t becoming a better piano player. He had watched countless YouTube videos and put in plenty of practice time. Gribben had been the CEO of Serato Audio Research for a decade and he also had experience DJing. It was this varied background that perfectly prepared him to solve his piano practice exasperation. Since he couldn’t find any existing products on the market to remedy his standstill, he started a company that would. He launched Melodics in 2015 with lessons in pad-based percussion, to see if his model would work, and then the company quickly expanded to offer electronic drums, and most importantly for Sam, keyboards. 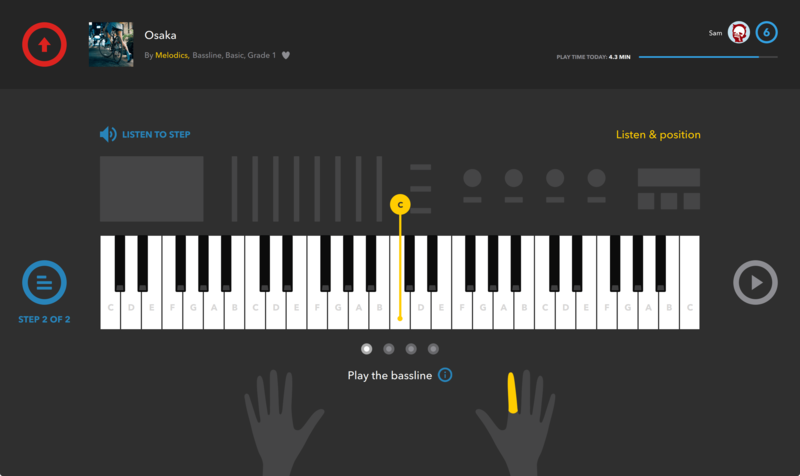 Borrowing aspects from modern music production software and taking some cues from video games, it’s a music lesson experience designed to be accessible, motivating, and enjoyable for learners. Importantly, the need to be literate in traditional music notation is sidestepped. The scrolling notation in Melodics is part Guitar Hero and part piano roll. This lesson from Aron Ottignon covers off the first five notes of the C Major scale. The key to the Melodics approach is making practice fun and productive, and Sam is adamant that five minutes of practice each day will pay dividends. MELODICS IS A SPONSOR OF BERKLEE ONSITE 2019: LEARN MORE! “Melodics is definitely about learning to play an instrument, but it’s much more about helping people to practice and get into good habits of practicing a bit every day, and to make that practice as effective and efficient as possible,” he says. Melodics’ front-facing language is even more rigid … about not being rigid! Indeed, those genres are the ones that Melodics mines. Many lessons are built around hit songs by the likes of Drake, Diplo, and Charlie Puth. Additionally, an ever-growing roster of DJs and producers from around the world, including Step1, Mark de Clive-Lowe, and DJ Jazzy Jeff, produce original lessons and content. “A big part of the audience is music producers, that’s really where we’re focused,” says Sam, but the experience is also designed to be kid-friendly, and marketed to parents on the grounds that it is more engaging, efficient, and affordable than traditional music lessons. Progress is tracked via levels, and learners level up by banking stars earned at the end of each lesson. While it might feel like you’re playing a game, you’re actually building muscle memory and improving your technique with each session. But is the Melodics way better than standard music notation? CHECK OUT MELODICS.COM TO LEARN MORE!